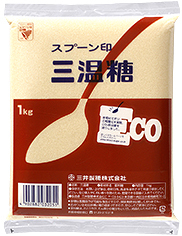 カップ印(Teacup brand) sugars are dominant in the market. 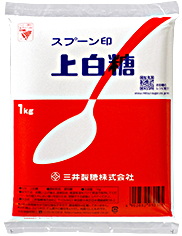 Johakuto(上白糖)- White sugar, used for cooking in general. Made with sugar canes. Invert sugar is added to increase sweetness in the final process. The texture is moist compared to caster sugar. Guranyuto(グラニュー糖)- Caster sugar. Used for baking. Made with sugar canes. Sanonto(三温糖)- Light brown color sugar used for braised dishes and stewed dishes. This is made by caramelizing the white sugar and it does not contain any minerals like the dark brown sugar. Kurosato(黒砂糖) - Unrefined dark brown sugar such as Kokuto(黒糖) and muscovado sugar. Contains minerals, iron and calcium. Kibisato(きび砂糖) - Cane sugar - This is a light color sugar which is made by boiling down raw cane sugar. It still contains the minerals from the sugar cane. It is multi-purpose sugar that can be used for cooking and baking. 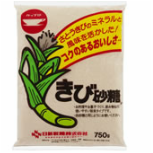 Tensaito(てんさい糖) - Sugar made from sugar beets. It contains oligosaccharide which is helps digestion and constipation. Wasanbon(和三盆) - Japanese sugar made from a special species of sugar cane. Used for making Japanese sweets. Very expensive. I personally use kibisato (cane sugar) for all my cooking. As for baking, I would use Granyuto (caster sugar) in general just to keep the color. Kibisato is more expensive than Johakuto, but it contains minerals without sacrificing its taste. For your info, Sugar beets are mainly produced in Hokkaido, the north island of Japan. It is known that this sugar will keep your body warm. On the other hand, sugar canes are from Okinawa, the southern island of Japan - is known to cool your body. Equivalent to caster sugar, but they are more expensive than Johakuto(上白糖) so if you don't mind the texture (johakuto is more moist), you can use johakuto. These are the brown sugar with some health benefits. This is the most common sugar and least expensive. The is the light brown sugar, which is made by caramelizing the johakuto.